That seems to be the theme from today’s travels….not nearly as much fun as the movie of the same name. For us, 360 miles is a very long day on the road. So glad to pull into Village Green Campground in North Kingsville, OH at nearly 5pm! Once we had the Fireball leveled, we didn’t even bother to unhitch. Have to admit that we probably made the wrong choice by passing up Geneva Lake State Park for this little township park just to the north, just a few miles from the PA border. We pulled in, expecting a vacant campground, and found it packed with seasonal campers. We were directed to an open spot, about 5 feet from our neighbor. oh boy! This isn’t a photoworthy campground, by any means. 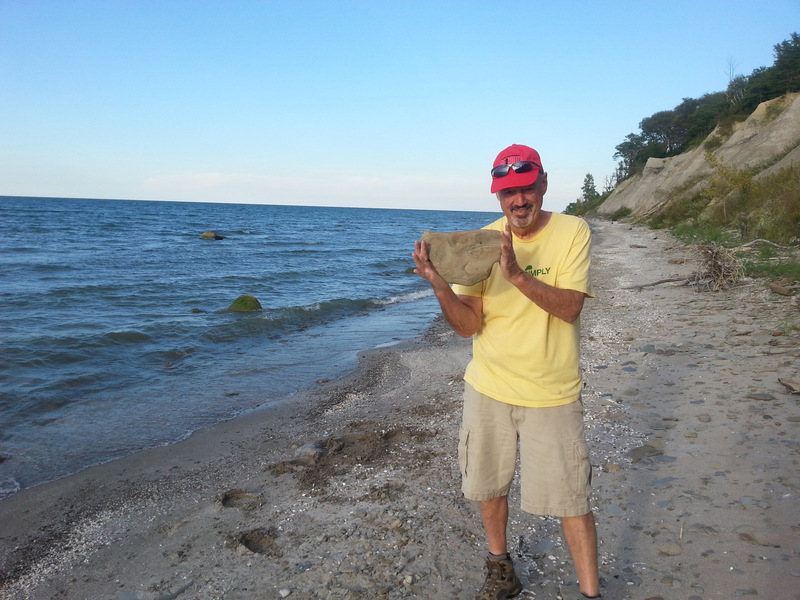 The great thing is that we’re only about 1/2 mile from Lake Erie, and a deserted lakeshore. Jezzy was ecstatic to be released from the truck’s captivity. Once we navigated the steep bank down to the water’s edge, she was allowed to run free of her leash, since there wasn’t a soul in sight. 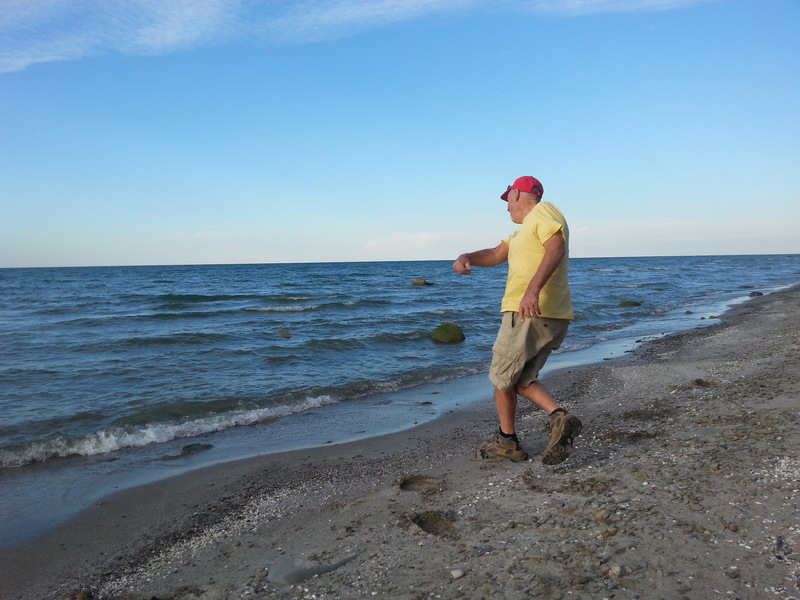 What we did find were thousands of perfect skipping stones – we tried small, medium, and ridiculously huge. Got some spectacular high hops, but never more than three before submersion. Practice makes perfect. 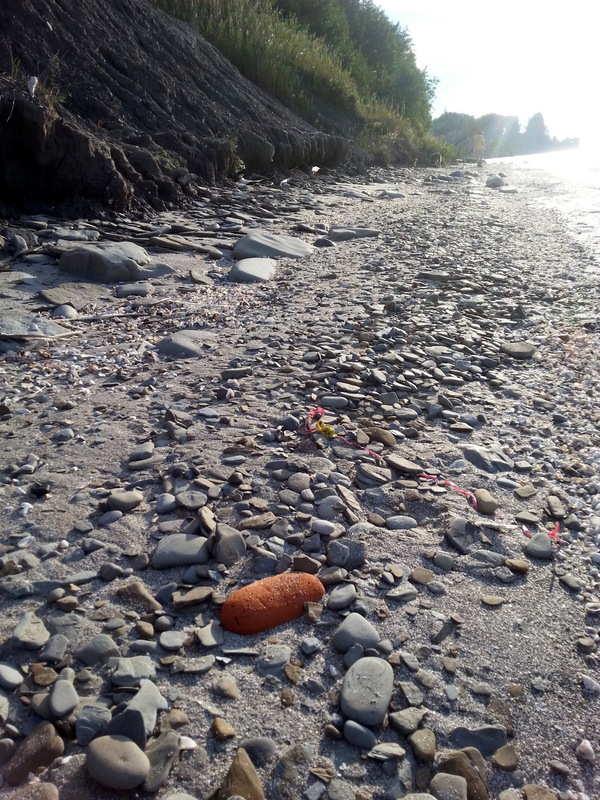 Found a bright red stone on the beach for my rock garden, and think it may be what’s left of a red brick. The big mystery of the day was – How did this huge tire get down here on this narrow little piece of beach? Today’s title comes from the fact that we did nothing but fight trucks and cars on a busy highway today. Once we got back to the Fireball after our walk and made dinner, we noticed that we’re probably not 150 yards from some really busy railroad tracks. The Fireball vibrates! yikes. How can it be possible that we are so lucky as to apparently be on a flight path to some nearby airport as well? Hoping my other campground choices are happier. Short travel day tomorrow – only about 210 miles. We’ll be in Seneca Falls, NY. Can’t wait! This entry was posted in camping, dogs, great outdoors, retirement, RV life, simple camping, T@DA and tagged camping, road trip, RV life, simple camping by Judy Crankshaw. Bookmark the permalink. 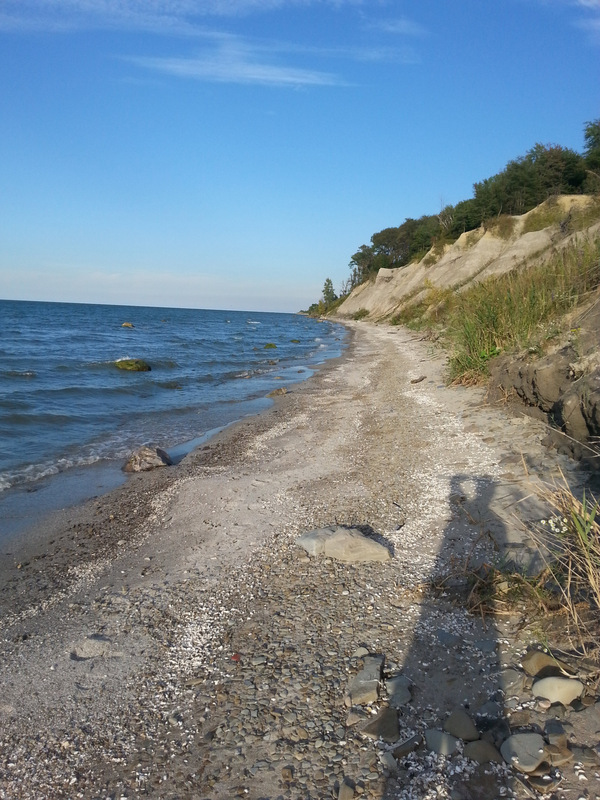 Loved the Lake Erie photos. Hope you have a comfortable trip and a nice campground tomorrow. Glad you had the beach escape to stretch your legs! When we were on the Mississippi the trains had the loudest horn ever and did they love to blow it!! Here’s hoping the next stop if over the top….travel safe! Maybe the Canadian Mounties wouldn’t have checked the Fireball for dog food? Hope tomorrow brings a nicer day. The shore was pretty though. Probably could have gotten away it, but if Jezzy’s food would have gotten confiscated it would be bad. Ohio??? John..Renae got us farther than that all by hereself !!! Road Warriors, we’re not. Travels with the Fireball seem to require many stops.